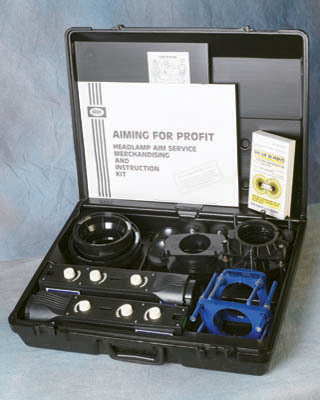 The Hoppy B4A Aimer Kit is a proven professional tool that is cost effective and simple to operate. It is a mechanical aimer that requires the headlamp to have the three glass nubs and horizontal / vertical specifications located on the lens. In the early 1980’s the SAE and the federal government began to allow aerodynamic styling to headlights. At this time the federal law was modified to allow headlamp manufactures to design headlamps without aim pads as long as there was a fiduciary method to aim the headlight. These aim pads are diminishing from most of the new vehicles on the market today. If there are no aim pads on the lens, the B4A will not work. It will require an optical aimer such as the V100 or the VA-25 to aim the headlight. 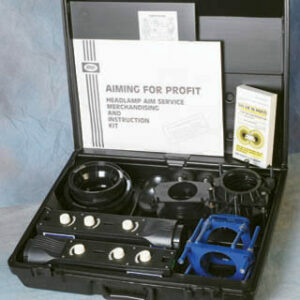 The B4A is still the tool of choice amongst the automotive technician that is into old vehicle restoration. FOR USE ON HEADLAMPS WITH AIMING PADS ONLY.